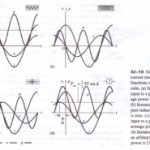 Electrical and currents playa vital role in the nervous systems of animals. impulses is basically an electrical process, although the mechanism 0 m h more complex than in simple materials such as metals. A nerve fiber. 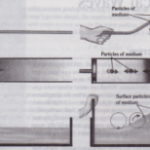 ex ong which an electrical impulse can travel has a cylindrical membrane with ODe g fluid inside and another outside (Fig. 26-25a). In the resting condition the ed bodies that can cross the membrane are Positively charged potassium i h leak out of the axon into the surroundings. This leaves the inside of the axon rith a net negative charge and a potential of about -70 mV (-0.07 V) with respect to the outer fluid. 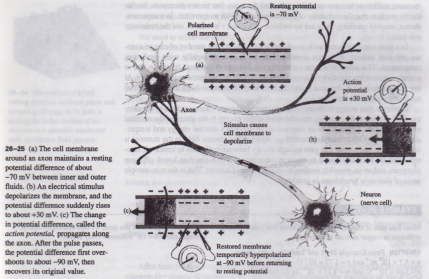 When an electrical stimulus is applied to the axon, the membrane temporarily becomes more permeable to other ions in the fluids, leading to a local change in potential difference (Fig. 26-25b). This disturbance, called the action potential, propagates along the membrane as a pulse with a speed of the order of 30 mfs. The entire pulse passes a given point along the axon in a few milliseconds, after which the membrane recovers and the potential difference returns to its initial value (Fig. 26- 25c). 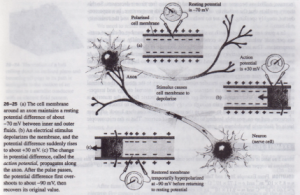 The electrical nature of nerve impulses explains why the body is sensitive to externally supplied electrical currents. Currents through the body as small as 0.1 A can be fatal because they interfere with essential nerve processes such as those in the heart. Even smaller currents can also be very dangerous. A current of 0.01 A through an arm or leg causes strong, convulsive muscle action and considerable pain; with a current of 0.02 A, a person holding the conductor that is inflicting the shock is typically unable to release it. Currents of this magnitude through the chest can cause ventricular fibrillation, a disorganized twitching of heart muscles that pumps very little blood. Surprisingly, very large currents (over 0.1 A) are somewhat less likely to cause fatal fibrillation because the heart muscle is “clamped” in one position. The heart actually stops beating and is more likely to resume normal beating when the current is removed. The electric defibrillators used for medical emergencies apply a large current pulse to stop the heart (and the fibrillation) to give the heart a chance to restore normal rhythm. Body fluids are usually quite good conductors because of their substantial ion concentrations. By comparison the resistance of skin is relatively high, ranging from 500 kO for very dry skin to 1000 0 or so for wet skin, depending also on the area of contact. If R = 1000 0, a current of 0.1 A requires a potential difference of V = IR = (0.1 A)(lOOO 0) = 100 Y. Were it not for the high resistance of skin, even an ordinary 1.5- Y flashlight battery could produce a hazardous shock. In summary, electric current poses three different kinds of hazards: Interference with the nervous system, injury caused by convulsive muscle action, and burns from fR beating (described in Section 26-6). The moral of this rather morbid story is that certain conditions, voltages as small as 10 Y can be dangerous. AU electrical circuits and electrical equipment should always be approached with respect and caution.